Your room has French doors leading out onto a small patio where you can sit and enjoy the outdoor air. You have a double bed and an en-suite ‘walk in’ shower room. This room has been set up for category one disabled but care has been taken to ensure it does not feel clinical like some rooms of this sort. Category one is for unassisted wheel chair users and our room has been inspected as compliant by the Scottish Tourist Board/VisitScotland. This room is available for single occupancy. 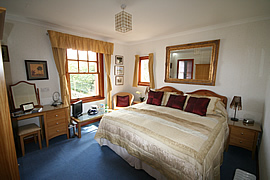 Your room has a king size double bed and the en-suite bathroom has a shower over the bath. Here you can enjoy a view across fields to Carradale Bay. This room is available for single occupancy. Your room can be either a twin or a super king double. The en-suite bathroom has a shower over the bath. You will enjoy a view across the bay, at the front of the house, to the golf course and the Arran hills across the Kilbrannan Sound. Your room has a king size double. You are at the front of the house so enjoy views to the golf course and the Arran hills across the Kilbrannan Sound. 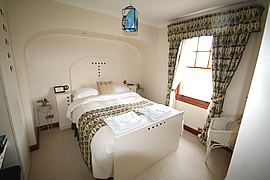 The room has been decorated in a Charles Rennie Macintosh style and has an en-suite shower room. This room is available for single occupancy. 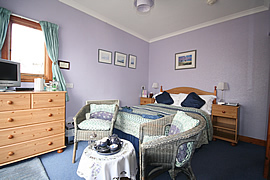 Your room can be either a twin or a super king double and the en suite bathroom has a shower over the bath. You overlook the bay, at the front of the house, to the golf course and the Arran hills across the Kilbrannan Sound. 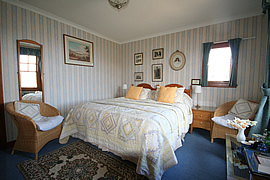 In these rooms you look out over the back of the house to the garden and the hill that used to be the wildlife reserve. You share a bathroom which also has a separate shower. Room eight is a twin and Room nine is a single. We also have a cot available. These rooms are popular with guests on a budget or singles who do not wish to pay the single supplement but are most often used by the younger part of a family group.